This performance of Bruckner's 8th Symphony was recorded in the Semperoper, Dresden on June 10, 2012 and is the first in a projected complete cycle of the Bruckner symphonies. An opera house is an unlikely venue for this most unoperatic of symphonies, but the performance is magnificent and was justly met with that very rare phenomenon – a standing ovation from a European symphony audience. Thielemann's interpretation is very weighty and feels slow. Looking at the timings reveal that the performance is no slower than most. What it has, though, is a rare sense of deliberateness and purpose. One way in which this reveals itself is in the balance within and across the four movements. Each of the first three movements is perfectly paced to set up its successor, and the tempo of the finale is exactly right to recapitulate its predecessors. The first movement is 16'03" but feels slower. There is a great dramatic build up that still respects the movement's lyrical passages with fine wind playing and well shaped phrasing in the strings. The tension is dissipated in the coda. In the second movement the contrast between the Scherzo and the Trio is well judged. The first occurrence of the Scherzo allows the much slower Trio to be foregrounded, while the reprise of the Scherzo feels much more driving and nicely frames an Adagio that is both lyrical and probing. The balance and dialog between strings, wind, and brass is particularly fine both in this movement and in the wonderfully paced finale. I only have a couple of quibbles, one with the recording and one with the videography. The first is minor. The harp seems artificially foregrounded in the early parts of the Adagio, temporarily distorting the balance of the music. The second is much more significant. The videographer registers the climax of the Adagio with a pedestrian panning shot around the opera house. This adds nothing to the music and runs a serious risk of distracting the listener/viewer. But putting these quibbles to one wide, musically this is most impressive and bodes well for the rest of the cycle. 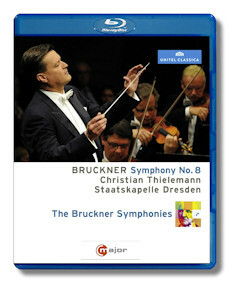 Thielemann is cementing his position as one of the leading contemporary Bruckner conductors. Highly recommended.